Fluorogypsum and phosphogypsum are sulfate-rich by-products generated during the production of hydrofluoric and phosphoric acid, respectively. Fluorogypsum is generated during the production of hydrofluoric acid from fluorspar (a mineral composed of calcium fluoride) and sulfuric acid. Fluorogypsum is discharged in slurry form and gradually solidifies into a dry residue after the liquid has been allowed to evaporate in holding ponds. When removed from the holding ponds (if it is to be used), the dried material must be crushed and screened. This produces a sulfate-rich, well-graded sandy silt material with some gravel-size particles. Approximately 90,000 metric tons (100,000 tons) of fluorogypsum are generated annually in the United States, mostly in Delaware, New Jersey, Louisiana, and Texas. Phosphogypsum is a solid by-product of phosphoric acid production. 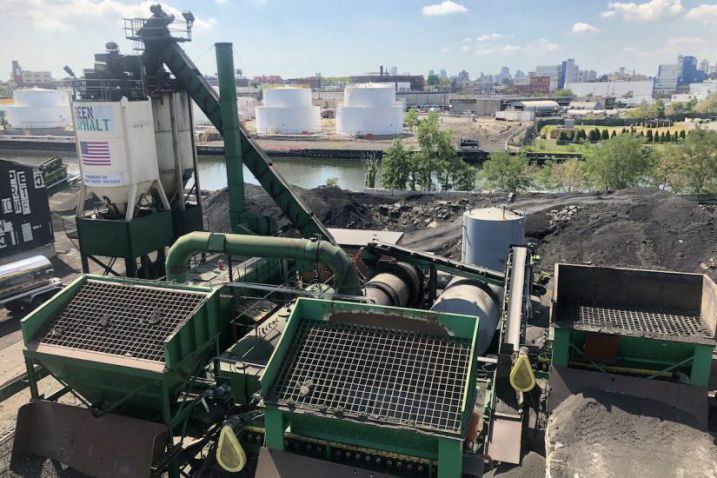 The most frequently used process for the production of phosphoric acid is the "wet process," in which finely ground phosphate rock is dissolved in phosphoric acid to form a monocalcium phosphate slurry. Sulfuric acid is added to the slurry to produce phosphoric acid (H3PO4) and a phosphogypsum (hydrated calcium sulfate) by-product. Phosphogypsum is generated as a filter cake in the "wet process" and is typically pumped in slurry form to large holding ponds, where the phosphogypsum particles are allowed to settle. The resulting product is a moist gray, powdery material that is predominantly silt sized and has little or no plasticity. Approximately 32 million metric tons (35 million tons) of phosphogypsum are produced annually, mostly in central Florida, but also in Louisiana and southeastern Texas. Total accumulations of phosphogypsum are well in excess of 720 million metric tons (800 million tons) and are expected to approach 900 million metric tons (1 billion tons) by the year 2000. (1) As a general rule, 4 to 5 metric tons (4.5 to 5.5 tons) of phosphogypsum are generated for every ton of phosphoric acid produced. All fluorogypsum is currently landfilled or disposed of in holding ponds. At the present time all phosphogypsum is stockpiled in large stacks, some of which may occupy several hundred hectares of land. Fluorogypsum that has solidified in sedimentation ponds is removed by blasting, crushing, and screening, much like rock is obtained from a quarry. The recovery and processing of solidified fluorogypsum results in a coarse or "crusher run" type of aggregate with a 38 mm (1-1/2 in) top size and fine calcium sulfate or "natural fines," which is predominantly a sand- and silt-sized material. (2) The recovery and processing of solidified fluorogypsum may be accomplished by commercial aggregate producers who are under contract to the chemical companies. Phosphogypsum may be obtained by directly contacting phosphate producers located mainly in Florida, Louisiana, or Texas, since the companies that mine phosphate rock and produce fertilizers from it also have ownership rights to the phosphogypsum stacks. To date, phosphogypsum has been successfully demonstrated as a road base material in stabilized and unbound base course installations and in roller-compacted concrete mixes. The only processing required for the phosphogypsum is the use of a vibrating power screen to break up lumps prior to mixing with a binder. As previously noted, fluorogypsum solidifies in holding ponds and must be removed, crushed, and graded, if it is to be used as an aggregate substitute material. In the process of size reduction, coarse 38 mm (1-1/2 in) top size material and fine, minus 2.0 mm (No. 10 sieve), sulfate-rich material is produced. The coarse sulfate is a well-graded sand and gravel size material, while the fine sulfate is a silty-clay type material. Table 1 presents some typical fluorogypsum particle size ranges, moisture content and specific gravity values. The average moisture content of the coarse sulfate material reportedly ranges from 6 to 9 percent, while the average moisture content of the fine sulfate material ranges from 6 to 20 percent. The average specific gravity of the coarse and fine sulfate is approximately 2.5, indicating that fluorogypsum is slightly lighter in weight than naturally occurring aggregates, such as crushed limestone or sand and gravel. (1) Table 1. Typical physical properties of fluorogypsum. Table 2 presents an average chemical analysis of samples of coarse and fine fluorogypsum. (1) Fluorogypsum is primarily calcium sulfate with approximately 1 to 3 percent fluoride present. It exhibits slightly acidic properties. a. Values of pH expressed in pH units. There are two predominant forms of phosphogypsum: dihydrate phosphogypsum (CaSO4×2H2O) and hemihydrate phosphogypsum (CaSO4×½H2O). Dihydrate phosphogypsum is generally more finely graded than hemihydrate phosphogypsum. Table 3 presents some typical physical properties of phosphogypsum. The major constituent in phosphogypsum is calcium sulfate and, as a result, phosphogypsum exhibits acidic properties. Table 4 presents a listing of some typical chemical analyses of phosphogypsum samples from different production areas. (11) Phosphogypsum often contains small residual amounts of phosphoric acid and sulfuric acid and also contains some trace concentrations of uranium and radium, which result in low levels of radiation. Table 5 presents some typical mechanical property values of phosphogypsum. The shear strength of unconsolidated-undrained specimens of unstabilized phosphogypsum has exhibited average internal friction angles of 32 degrees and cohesion values of 125 kN/m2 (18 lb/in2). Cement-stabilized specimens have exhibited internal friction angle values ranging from 28 to 47 degrees, and cohesion values from 76 to 179 kN/m2 (11 to 26 lb/in2). (12) Coefficient of permeability values for unstabilized phosphogypsum have been found to range from 1.3 ´10-4 cm/sec down to 2.1 ´ 10-5cm/sec. U.S. Environmental Protection Agency, Office of Solid Waste. Report to Congress on Special Wastes from Mineral Processing. Report No. EPA 530-SW-90-070B, Washington, DC, July, 1990. Usmen, Mumtaz A. and Lyle K. Moulton. "Construction and Performance of Experimental Base Course Test Sections Built with Waste Calcium Sulfate, Lime, and Fly Ash," Transportation Research Record No. 998, Transportation Research Board, Washington, DC, 1984. Clifton, James R., Paul W. Brown and Geoffrey Frohnsdorff. Survey of Uses of Waste Materials in Construction in the United States. National Bureau of Standards, Report No. NBSIR 77-1244, Washington, DC, July, 1977. Gregory, C.A., D. Saylak, and W.B. Ledbetter. "The Use of By-Product Phosphogypsum for Road Bases and Subbases," Transportation Research Record No. 998. Transportation Research Board, Washington, DC, 1984. Chang, Wen F., David A. Chin and Robert Ho. Phosphogypsum for Secondary Road Construction. Florida Institute for Phosphate Research, Publication No. 01-033-077, Bartow, Florida, June, 1989. Chang, Wen F. A Demonstration Project: Roller Compacted Concrete Utilizing Phosphogypsum. Florida Institute for Phosphate Research, Publication No. 01-068-072, Bartow, Florida, December, 1988. Code of Federal Regulations. "National Emission Standards for Hazardous Air Pollutants," 40 CFR Part 61. July 1, 1996. Smith, L.M. and H.G. Larew. User's Manual for Sulfate Waste in Road Construction. Federal Highway Administration, Report No. FHWA-RD-76-11, Washington, DC, December, 1975. American Coal Ash Association. Coal Combustion By-Product Production and Use: 1966-1993. Arlington, Virginia, 1995. ASTM D3282. "Standard Practice for Classification of Soils and Soil-Aggregate Mixtures for Highway Construction Purposes." American Society for Testing and Materials, Annual Book of ASTM Standards, Volume 04.08, ASTM, West Conshohocken, Pennsylvania, 1994. Taha, Ramzi and Roger Seals. "Engineering Properties and Potential Uses of By-Product Phosphogypsum." Proceedings of Utilization of Waste Materials in Civil Engineering Construction. American Society of Civil Engineers, New York, NY, September, 1992. Lopez, Alfred M. and Roger K. Seals. "The Environmental and Geotechnical Aspects of Phosphogypsum Utilization and Disposal,"Environmental Geotechnology. Rotterdam, The Netherlands, 1992. There have been a limited number of stabilized base installations in which either fluorogypsum or phosphogypsum have been used. The most extensive experience to date with each of these materials has been in or around Houston, Texas. The earliest known application in which fluorogypsum was used in stabilized base compositions occurred during the construction of the TRANSPO’72 International Transportation Exposition held in 1972 at Dulles Airport near Washington, D.C. A portion of the new 40 hectare (100 acre) parking area was used by the Federal Highway Administration (FHWA) to demonstrate the potential for use of base course mixtures containing a number of calcium sulfate wastes including fluorogypsum. Fluorogypsum use in stabilized road base has been limited to one demonstration project in West Virginia and several construction projects in Texas. In August 1981, four test sections of lime-fly ash-fluorogypsum, each approximately 3.0 meters (10 feet) wide by 30 meters (100 feet) long, were constructed as side by side pairs within the base course of a plant haul road at the Allied Chemical Company plant in Nitro, West Virginia. Each test section had an increased percentage of fluorogypsum and a decreased percentage of fly ash, while using 5 percent lime. One test section contained 75 percent coarse fluorogypsum sulfate, while the other three contained from 30 to 65 percent fine fluorogypsum. Fluorogypsum solidifies in holding ponds and must be excavated and removed, which normally results in both a fine and a coarse fraction. The resultant products are referred to as coarse and fine sulfate. Besides the initial excavation and breakdown into different size pieces, further processing will usually require some type of crushing and/or screening, much like a conventional aggregate. This can be achieved using standard construction and/or mineral processing equipment. Phosphogypsum is a fine, damp, silty material. Construction of stabilized base mixtures in which phosphogypsum is to be dumped and spread, then mixed in place with other additives (sand, cement, and/or self-cementing fly ash) using a pulvi-mixer, essentially requires no processing unless the phosphogypsum is excessively wet. In such cases, the material should be allowed to dry somewhat before being used. If unable to be satisfactorily dried in a stockpile, the wet phosphogypsum may need to be spread out in fairly thin layers for a few days. If the phosphogypsum is to be blended with the other additives using a mixing plant, the phosphogypsum should first be passed over a power screen in order to break up any lumps prior to being fed into the plant. Some of the engineering properties that are of particular interest if fluorogypsum is used as an aggregate in stabilized base and subbase applications include gradation, moisture content, specific gravity, and Los Angeles Abrasion loss. Moisture Content: Coarse fluorogypsum has a moisture content from 6 to 9 percent with an average of 7.5 percent. Fine fluorogypsum has a moisture content that ranges from 6 to 20 percent, with an average of 11 percent. Some of the engineering properties of phosphogypsum that are of particular interest in stabilized base and subbase applications include gradation, moisture content, specific gravity, moisture-density relationship, and unconfined compressive strength. It should also be noted that phosphogypsum is usually slightly radioactive and that the level of radioactivity must be determined prior to making any use of the material. Gradation: The grain size of phosphogypsum typically ranges from approximately 0.50 mm (0.02 in) to 0.02 mm (0.0008 in), with between 60 and 80 percent of all particles being finer than a 0.075 mm (No. 200) sieve. The gradation is generally determined by the degree of grinding received by the ore during the beneficiation process. Phosphogypsum is generally classified as a silt or sandy silt. (12) Material that has been stacked for some time tends to develop agglomerations, thus reducing its fineness or percentage passing the 0.075 mm (No. 200) sieve. Moisture Content: The moisture content or amount of free moisture in phosphogypsum may range from 3 to 20 percent. Specific Gravity: The specific gravity of solids ranges from 2.30 to 2.50, with an average in the 2.35 to 2.40 range. (12) Phosphogypsum has little or no plasticity. Unconfined Compressive Strength: The unconfined compressive strength of phosphogypsum when compacted in a standard Proctor(14) mold at an optimum moisture content of 16.7 percent is typically 96 kPa (14 lb/in2) when soaked and about 1690 kPa (245 lb/in2) when air dried. (7) These are values for compacted phosphogypsum without the addition of a stabilization reagent. The maximum dry density and optimum moisture content conditions for each of these mixes were initially established using standard Proctor (ASTM D698)(14) test procedures. The moisture content identified as optimum is the recommended moisture content for molding test specimens for unconfined compressive strength testing. Testing for unconfined compressive strength and durability should be done in accordance with ASTM C593(15) procedures. The parameter that usually governs mix design proportions for stabilized base compositions containing phosphogypsum is the unconfined compressive strength. Unless local or state specifications require otherwise, the criteria for mix proportioning is typically based on the compressive strength and freeze-thaw durability requirements of ASTM C593. (15) This specification, which was originally developed for lime-fly ash-aggregate base course mixtures, requires that stabilized base mixtures attain 2760 kPa (400 lb/in2) unconfined compressive strength after 7 days of curing at 38oC (100oF) and also after vacuum saturation. The fly ash normally used in such mixtures is pozzolanic fly ash. The optimum moisture content for cement-stabilized base mixes containing phosphogypsum can be determined in accordance with the test procedures of ASTM D558. (16) Some states (such as Texas) have imposed more stringent strength criteria than ASTM C593 where cement-stabilized base mixtures are designed to achieve a minimum compressive strength of 4500 kPa (650 lb/in2) after 7 days of curing at 23oC (73oF). Other states (such as Louisiana) specify that soil-cement mixtures have a minimum compressive strength of only 1725 kPa (250 lb/in2) after 7 days of ambient temperature curing. Depending on weather conditions, it may be advisable to evaluate durability (wet-dry) testing in accordance with ASTM D559. (17) Since phosphogypsum is only produced in Florida, Louisiana, and Texas, it is unlikely that freeze-thaw durability criteria in these locations will be of significance in determining mix design proportions. Trial mixes of phosphogypsum and reagent should be prepared at optimum moisture content using increasing reagent percentages. Test specimens should be sealed in plastic bags, cured, and then tested for 7 day unconfined compressive strength. Longer term (28, 56, and 90 days) curing and compressive strength testing is also recommended to ensure that the design mix does not lose strength over time. The main factors influencing the selection of the structural layer coefficient for thickness design using the AASHTO method are the compressive strength and modulus of elasticity of the stabilized base material. The value of compressive strength recommended for determination of the structural layer coefficient is the field design compressive strength. The field design compressive strength is simulated by the compressive strength developed in the laboratory after 56 days of moist curing at 23oC (73oF). (22) However, other curing conditions may be required by various specifying agencies. Construction procedures for stabilized base and subbase mixtures in which sulfate wastes (fluorogypsum and phosphogypsum) are used are essentially the same as those used for more conventional pozzolanic stabilized bases and subbases. Fluorogypsum, once it has been crushed and sized, can be stockpiled much like any conventional aggregate. However, lengthy stockpiling is not recommended because the particles may begin to weather or break down over an extended period of time. Phosphogypsum must be evaluated for its radiation level prior to use. If suitable for use (i.e., radiation level less than 10 pCi/g), phosphogypsum can be stockpiled in the same way as soil. The material should not be stockpiled for an extended period under rainy conditions or it may become excessively wet. The blending or mixing of sulfate waste in stabilized base mixtures can be done either in a mixing plant or in place. Plant mixing is recommended because it provides greater control over the quantities of materials batched and also results in the production of a more uniform mixture. Mixing in place does not usually result in as accurate a proportioning of mix components as plant mixing. 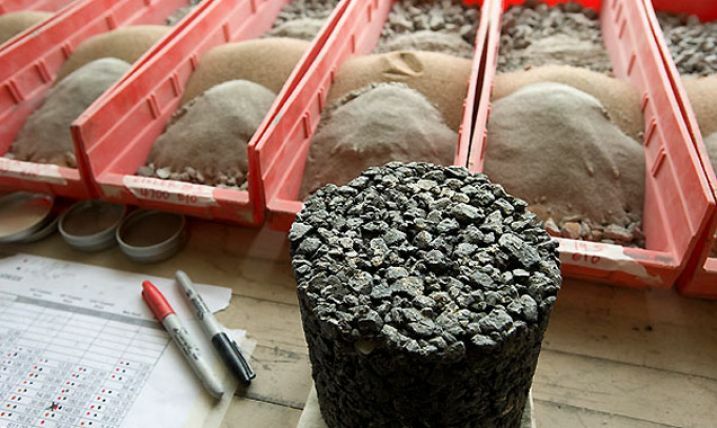 To develop the design strength of a stabilized base mixture, the material must be well compacted and must be as close as possible to its optimum moisture content when placed. Plant-mixed materials should be delivered to the job site as soon as possible after mixing and should be compacted as soon as possible after placement. This is particularly the case with mixtures in which self-cementing fly ash is used as an activator. Stabilized base materials containing sulfate waste should not be placed in layers that are less than 100 mm (4 in) nor greater than 200 to 225 mm (8 to 9 in) in compacted thickness. These materials should be spread in loose layers that are approximately 50 mm (2 in) greater in thickness prior to compaction than the desired compacted thickness. The top surface of an underlying layer should be scarified prior to placing the next layer. Smooth drum, steel-wheeled static rollers are most frequently used for compaction of base materials containing sulfate waste. Stabilized base materials containing sulfate waste that are subjected to freezing and thawing conditions must be able to develop a certain level of cementing action and in-place strength prior to the first freeze-thaw cycle in order to withstand the disruptive forces of such cycles. For northern states, many state transportation agencies have established construction cutoff dates for stabilized base materials. These cutoff dates ordinarily range from September 15 to October 15, depending on the state, or the location within a particular state, as well as the ability of the stabilized base mixture to develop a minimum desired compressive strength within a specified time period. (22) These cutoff dates are more applicable to fluorogypsum than phosphogypsum, since phosphogypsum is only produced in Florida, Louisiana, and Texas, where winter weather is usually mild. Stabilized base materials containing sulfate waste, especially those in which Portland cement is used as the reagent, may be subject to crack development. The cracks are almost always shrinkage related and are not the result of any structural weakness or defects in the stabilized base material. Unfortunately, shrinkage cracks eventually reflect through the overlying asphalt pavement and must be sealed at the pavement surface to prevent water intrusion and subsequent damage due to freezing and thawing. Cracking is also likely to occur when sulfate wastes are blended or stabilized with lime and pozzolanic fly ash, or with self-cementing fly ash. One approach to controlling or minimizing reflective cracking associated with shrinkage cracks in pozzolanic stabilized base materials has been to saw cut transverse joints in the asphalt surface that extend into the stabilized base material to a depth of 75 to 100 mm (3 to 4 in). Joint spacings of 9 m (30 ft) have been suggested. (22) For parking lots, the joints should be cut in two directions, perpendicular to each other at approximately the same spacing. The joints should all be sealed using a hot-poured asphaltic joint sealant. Because fluorogypsum is the only sulfate waste that dehydrates to form a solid instead of remaining a slurry or sludge, it has somewhat unique properties or characteristics, especially when crushed and sized into coarse and fine fractions. More information is needed concerning the properties or characteristics of fluorogypsum, along with its long-term field performance in stabilized base applications. To date, there is no known petition that has been made for the use of phosphogypsum in highway applications under the referenced regulation. The primary issue is the radon content and emissions from products containing phosphogypsum both during and after the useful service life of the product. Additional effort is required to determine what concentration and emission levels would be acceptable, and whether there are suitable applications in which phosphogypsum may be used under the terms of these regulatory provisions. Code of Federal Regulations. "National Emissions Standards for Hazardous Air Pollutants," 40 CFR Part 61, July 1, 1996. Brink, Russell H. "Use of Waste Sulfate on Transpo'72 Parking Lot," Proceedings of the Third International Ash Utilization Symposium. U.S. Bureau of Mines, Information Circular No. 8640, Washington, DC, 1974. Smith, Lloyd M. and Gordon Larew. "Technology for Using Waste Sulfate in Road Construction," Proceedings of the Fourth International Ash Utilization Symposium, Energy Research and Development Administration. Report No., MERC/SP-76/4, Morgantown, West Virginia, 1976. Usmen, Mumtaz A. and Lyle K. Moulton. "Construction and Performance of Experimental Base Course Test Sections Built with Waste Calcium Sulfate, Lime, and Fly Ash," Transportation Research Record No. 998, Washington, DC, 1984. Saylak, Donald, Scullion, Tom, and D.M. Golden. "Applications for FGD By-Product Gypsum," Proceedings of the Symposium on Recovery and Effective Reuse of Discarded Materials and By-Products for Construction of Highway Facilities. Federal Highway Administration, Publication No. FHWA-PD-94-025, Washington, DC, October, 1993. Lea, Reid, Faschan, Adam, and Marty Tittlebaum. "Environmental Monitoring Plan for a Pilot Study Using Phosphogypsum as a Roadbed Material." Proceedings of Conference on Utilization of Waste Materials in Civil Engineering Construction, American Society of Civil Engineers, New York, New York, September, 1992. Kumbhojkar, A.S. "Utilization of Phosphogypsum as a Construction Material," Proceedings of the Mediterranean Conference on Environmental Geotechnology, Rotterdam, The Netherlands, 1992. Chang, Wen F., Chin, David A., and Robert Ho. Phosphogypsum for Secondary Road Construction. Florida Institute for Phosphate Research, Publication No. 01-033-077, Bartow, Florida, June, 1989. Wong, C. and M. K. Ho. The Performance of Cement-Stabilized Base on State Highway 146, La Porte, Texas. Texas State Department of Transportation, Research Section, Austin, Texas, October, 1988. ASTM C131. "Standard Test Method for Resistance to Degradation of Small-Size Coarse Aggregate by Abrasion and Impact in the Los Angeles Machine." American Society for Testing and Materials, Annual Book of ASTM Standards, Volume 04.02, West Conshohocken, Pennsylvania, 1996. Taha, Ramzi and Roger Seals. "Engineering Properties and Potential Uses of By-Product Phosphogypsum," Proceedings of Conference on Utilization of Waste Materials in Civil Engineering Construction. American Society of Civil Engineers, New York, NY, September, 1992. ASTM D1557. "Standard Test Methods for Moisture-Density Relations of Soils and Soil-Aggregate Mixtures Using 10-lb. (4.54 Kg) Rammer and 18-in. (457 mm) Drop." American Society for Testing and Materials, Annual Book of ASTM Standards, Volume 04.08, West Conshohocken, Pennsylvania, 1996. ASTM D698. "Standard Test Methods for Moisture-Density Relations of Soils and Soil-Aggregate Mixtures Using 5.5 lb (2.49 Kg) Rammer and 12-in (305 mm) Drop." American Society for Testing and Materials, Annual Book of ASTM Standards, Volume 04.08, West Conshohocken, Pennsylvania, 1996. ASTM C593. "Standard Specification for Fly Ash and Other Pozzolans for Use with Lime." American Society for Testing and Materials, Annual Book of ASTM Standards, Volume 04.01, West Conshohocken, Pennsylvania, 1996. ASTM D558. "Standard Test Methods for Moisture-Density Relations of Soil-Cement Mixtures." American Society for Testing and Materials,Annual Book of ASTM Standards, Volume 04.08, West Conshohocken, Pennsylvania, 1996. ASTM D559. "Standard Methods for Wetting-and-Drying Tests of Compacted Soil-Cement Mixtures." American Society for Testing and Materials, Annual Book of ASTM Standards, Volume 04.08, West Conshohocken, Pennsylvania, 1996. Taha, Ramzi, Roger K. Seals, Willis Thornsberry, and James T. Houston. "The Use of By-Product Phosphogypsum in Road Construction," Presented at the 71st Annual Meeting of the Transportation Research Board, Washington, DC, January, 1992. Gregory, C. A., D. Saylak, and W. B. Ledbetter. "The Use of By-Product Phosphogypsum for Road Bases and Subbases," Transportation Research Record No. 998, Transportation Research Board, Washington, DC, 1984. American Coal Ash Association. Flexible Pavement Manual. Alexandria, Virginia, 1991. Thornton, Samuel I. and David G. Parker. Construction Procedures Using Self-Hardening Fly Ash. Federal Highway Administration, Report No. FHWA/AR/80-004, Washington, DC, 1980.